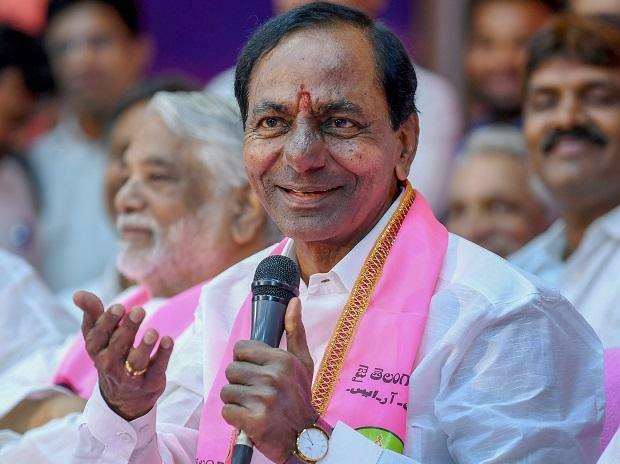 Chief Minister K Chandrasekhara Rao on Tuesday inducted 10 ministers, out of which six were new faces, as he expanded his two-member Cabinet after two months of forming the government on December 13. Earlier, the other member besides him in the Cabinet was Mohammad Mahmood Ali. However, his son K T Rama Rao and nephew T Harish Rao did not find a place in the cabinet this time around as had been speculated earlier. Rama Rao was already appointed as the working president of the ruling Telangana Rashtra Samiti (TRS) to give him a complete hold on the party organisation while Harish Rao is rumoured to be kept aside for a role in Lok Sabha in the upcoming Parliament elections. Among the new ministers, A Indrakaran Reddy, T Srinivas Yadav, G Jagadish Reddy and Etela Rajender worked for a full term in chief minister Rao's first government. New faces are Singireddy Niranjan Reddy, Koppula Eshwar, Yerrabelli Dayakar Rao, V Srinivas Goud, Vemula Prashanth Reddy and C Malla Reddy. The size of the cabinet has now gone up to 12 with an equal number of old and new faces, though the portfolios of the second term ministers have been changed. The new ministers were administered the oath of office and oath of secrecy by Governor E S L Narasimhan at a ceremony in Raj Bhavan in the morning. As the Telangana government can have a maximum number of 18 ministers proportionate to the 117-member legislative assembly, chief minister Rao is expected to fill in the remaining 6 berths after the Lok Sabha elections or in a couple of small cabinet expansions at his own convenience later, according to the political observers. And that would be the time when women and STs are expected to get a chance in the state cabinet. Chief minister Rao has expanded the cabinet just ahead of the budget sessions, which will commence on February 22.